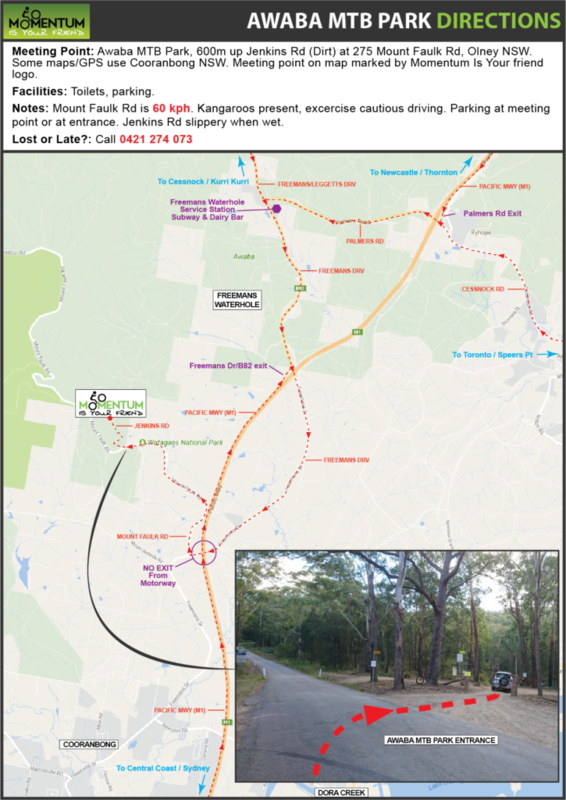 Downloadable maps and information for our Awaba MTB Park location. The Awaba Mountain Bike Park is built and maintained by the Hunter Mountain Bike Club (HMBA) and features over 12 kms of Cross Country race course, a nationally recognised Downhill track and a beginners Development track. At time of writing the HMBA were currently well into plans for several Gravity Enduro trails and even a Hand Cycle circuit. Awaba MTB Park, 600m up Jenkins Rd (Dirt) at 275 Mount Faulk Rd, Olney NSW. Some maps/GPS use Cooranbong NSW. Meeting point on map marked by Momentum Is Your friend logo. Mount Faulk Rd is 60 kph. Kangaroos present, excercise cautious driving. Parking at meeting point or at entrance. Jenkins Rd slippery when wet.